As most tales begin this time of year on a dark and snowy night so shall this one. While passing over the Erie Canal just outside of Chittenango my headlights briefly fell upon the outline of a strange machine. I had just enough time to see a set of tall skinny tires and a cab reminiscent of farmers combine. With construction and harvest season well behind us I could only wildly guess at what I had just seen. Strange as it was my mind quickly forgot about the mystery machine until the following night when I passed the exact same location and once again rediscovered its silhouette. By now it was Friday and I was convinced that it would be in the same spot come a bright Saturday morning. Returning to the parking lot the following day my hunch turned out to be dead wrong but there were a few service trucks from a Mayer Tree Service that gave a clue to what had been there. Later that evening I drove by again and the machine had returned! Clearly I had to get up early to catch this worm so I returned Sunday morning and finally was able to gaze up this thing……an Alback Diamant mobile chipper. As you can see the left side of the vehicle features a chute for the wood chips to exit the drum. On the right side you find a hydraulic arm to feed said drum. Out riggers are placed around the vehicle for stability and a set of smaller wheels tuck into the undercarriage when on the job site. While moving from location to location these wheels lower to reduce axle weight placed upon local roads. 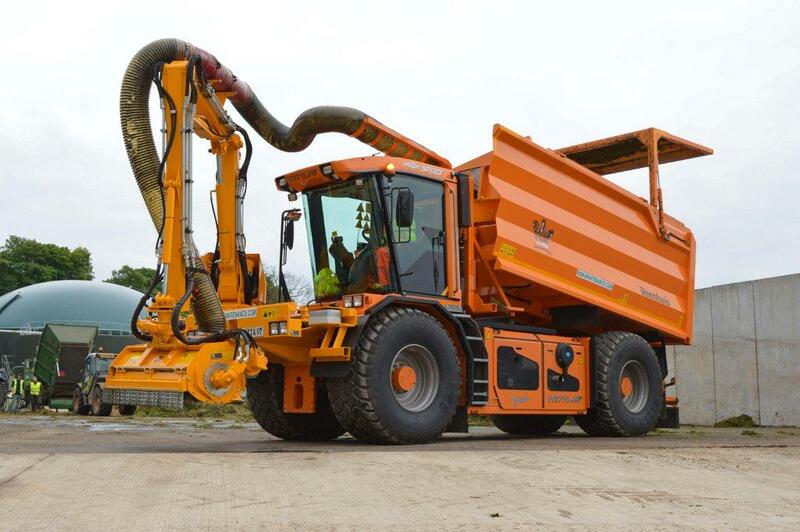 The operators cab can also raise for increased visibility. Powered by a single 700 HP Volvo engine the Diamant 2000 is a purpose built machine. It’s a realitivy new concept and completely blank slate design. Here in the U.S. there must only be a handful of these machine to be found. I wouldn’t be surprised if this is the only one. As to what it’s doing here in small town Chittenango? I can only guess it is traveling up and down the canal “tow path” clearing brush from the right of way. At the next parking lot some four miles west of this location sits a feller buncher. Some poking around the web finds that the NYS is clear cutting standing timber along the canal to restore the banks to their original pasture like condition. Apparently all the tree growth, specifically their roots, have compromised the integrity of certain sections. But enough of that, see the machine in action here. 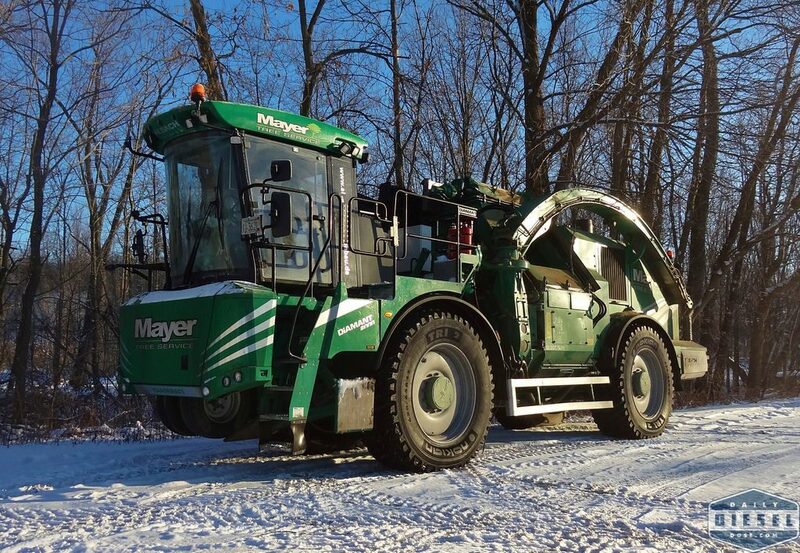 This entry was posted in Heavy Equipment and tagged albach diamant, mayer tree service. Bookmark the permalink. I do not understand why they are clear cutting the banks of the canal… Why start now? No one has cut a tree in literally 100 years from the old canal. More pasture like, even though they are going to pave the tow path? 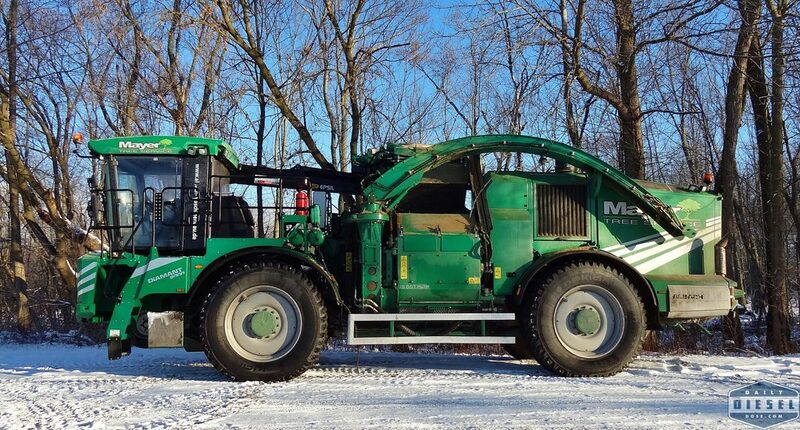 This one has a flail mower with vac on it…. Ah yes, I have post about the power platform on this site from March of 2011. It seems like a good idea by these specialty platforms rarely catch on. Even when they offer a variety of attachments. A bunch of these just went up for auction down in Maryland. These guys are from the Boston area. I have seen that machine in action, pretty mpressive. Cool. If it’s still around next week I might have a chance of seeing it live.